If you want to drive a truck or bus with air brakes or pull a trailer with air brakes, you need to study this section. If you want to pull a trailer with air brakes you also need to study Section 6: Combination Vehicles. Air brakes use compressed air to make the brakes work. 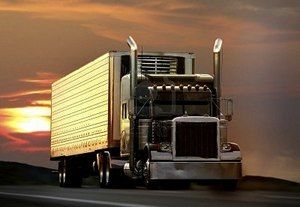 Air brakes are a good and safe way of stopping large and heavy vehicles when the brakes are well maintained and used properly. Air brake systems combine three braking systems: service, parking and emergency brake systems. The emergency brake system uses parts of the service and parking brake systems to stop the vehicle in the event of a brake system failure. The governor controls when the air compressor will pump air into the air storage tanks. When air tank pressure rises to the “cut-out” level (around 125 pounds per square inch, or “psi”), the governor stops the compressor from pumping air. When the tank pressure falls to the “cut-in” pressure (around 100 psi), the governor allows the compressor to start pumping again. Air storage tanks are used to hold compressed air. The number and size of air tanks vary among vehicles. The tanks will hold enough air to allow the brakes to be used several times even if the compressor stops working. Manually operated by turning a quarter turn (see Figure 5-1) or by pulling a cable. You must drain the tanks yourself at the end of each day of driving. Automatic, in which the water and oil are automatically expelled. They may be equipped for manual draining as well. Some air brake systems have an alcohol evaporator to put alcohol into the air system. This helps reduce the risk of ice in air brake valves and other parts during cold weather. Ice inside the system can make the brakes stop working. Check the alcohol container and fill up as necessary every day during cold weather. Daily air tank drainage is still needed to get rid of water and oil (unless the system has automatic drain valves). A safety relief valve is installed in the first tank the air compressor pumps air to. The safety valve protects the tank and the rest of the system from too much pressure. The valve is usually set to open at 150 psi. If the safety valve releases air, something is wrong. Have the fault repaired by a mechanic. Make sure you study and memorize all of the below definitions. You must know how to distinguish between the three different types of brakes for the written exam. You will see these terms many times so it's very important to memorize them now. 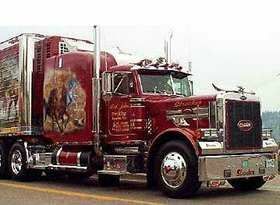 You'll need to study and know each part listed in section 5.1 for the air brake system. Use flash cards if you need to, but all of these parts must be memorized. For the written exam, you'll need to understand the difference between "cut out level" and "cut in pressure". You'll also need to know the air pressure level for each. Cut out pressure is around 125psi and cut in pressure is around 100psi. Be sure you have this memorized as it will come up quite often during your training. 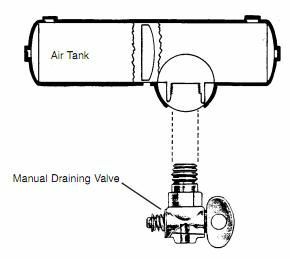 Remember: Manual air tank drains must be drained daily in order to get rid of water and oil inside the air tanks. You may be asked about this on the written exam. Make sure you remember that the safety relief valve generally opens at 150 psi. What is the purpose of Air Storage Tanks? In an air brake system, emergency brakes naturally want to activate. It is the air pressure which holds the emergency brakes back and keeps them from activating. Therefor, air is not required for emergency brakes to function. Rather, if air is depleted from the air tanks, the emergency brakes will automatically engage. What are Air Storage Tanks? What does an Alcohol Evaporator do? Alcohol Evaporator - Some air brake systems have an alcohol evaporator to put alcohol into the air system. This helps reduce the risk of ice in air brake valves and other parts during cold weather. Ice inside the system can make the brakes stop working. The governor controls when the air compressor will pump air into the air storage tanks. When air tank pressure rises to the "cut-out" level (around 125 pounds per square inch, or "psi"), the governor stops the compressor from pumping air. When the tank pressure falls to the "cut-in" pressure (around 100 psi), the governor allows the compressor to start pumping again. What does it mean for the air compressor to "cut in"? Air Compressor - The air compressor pumps air into the air storage tanks (reservoirs). The air compressor is connected to the engine through gears or a V-belt. The compressor may be air cooled or may be cooled by the engine cooling system. It may have its own oil supply or be lubricated by engine oil. If the compressor has its own oil supply, check the oil level before driving. Air Compressor Governor - The governor controls when the air compressor will pump air into the air storage tanks. When air tank pressure rises to the "cut-out" level (around 125 pounds per square inch, or "psi"), the governor stops the compressor from pumping air. When the tank pressure falls to the "cut-in" pressure (around 100 psi), the governor allows the compressor to start pumping again. Be sure to understand how the air compressor and air compressor governor both work. The air compressor governor does not supply air, rather, it tells the air compressor when it should or shouldn't be supplying air to the air storage tanks. The air compressor governor will begin supplying air around what PSI? When the tank pressure falls to the "cut-in" pressure (around 100 psi), the governor allows the compressor to start pumping again. Make sure you memorize the air pressure for when the governor will "cut in" and "cut out" as you will need to know this for the written exam, the pre-trip exam, and in the real world while checking your gauges going down the road. What is the purpose of Air Tank Drains? 1. Manually operated by turning a quarter turn or by pulling a cable. You must drain the tanks yourself at the end of each day of driving. 2. Automatic, in which the water and oil are automatically expelled. They may be equipped for manual draining as well. The automatic types are available with electric heating devices. These help prevent freeze-up of the automatic drain in cold weather. Which of the following statements about the Air Compressor is false? At what pressure will the air compressor governor tell the air compressor to "cut out"? When air tank pressure rises to the "cut-out" level (around 125 pounds per square inch, or "psi"), the governor stops the compressor from pumping air. Be sure to understand that the air compressor governor has one main purpose and that is to tell the air compressor when to pump air and when to stop pumping air. The air compressor governor will tell the air compressor to start supplying air (cut in) and when to stop supplying air (cut out). Cut in air pressure is usually when air pressure falls to about 100 psi. Which of the following statements is true about Air Tank Drains? Depressing the brake pedal activates which brake system? 1. The service brake system applies and releases the brakes when you use the brake pedal during normal driving. 2. The parking brake system applies and releases the parking brakes when you use the parking brake control. 3. The emergency brake system uses parts of the service and parking brake systems to stop the vehicle in the event of a brake system failure. It is very important that you memorize the difference between the service brake, parking brake, and emergency brake. Study what the function is of each as you'll likely be asked about all 3 on the written exam. These are also terms you will need to know when out in the "real world." Which of the following is true about the Air Compressor? What is the service brake? A system which uses parts of the service and parking brake systems to stop the vehicle in the event of a brake system failure. Memorize each definition and be sure you understand how each of these differ. Not only will this be critically important to passing the air brakes endorsement test but it is terminology you'll need to understand in the real world. How often should you drain air tanks with manual air tank drains? You must drain the tanks yourself at the end of each day of driving. Why do air tanks need to be manually drained?